Science Fiction Films of 1951: Giant Ants, Radioactive Rockets, & Flying Saucers! The 50’s must have been an amazing time to be a film fan, especially if you liked science fiction. Thanks to pilot Kenneth Arnold’s sighting of nine flying discs on June 24, 1947, the possibility of alien invaders became an all-too-real reality. America had just come out of World War II two years earlier and I am sure that people were still paranoid and tense. Nationwide reports of unidentified flying objects would only add to this paranoia and the film industry took full advantage by playing off of these fears. 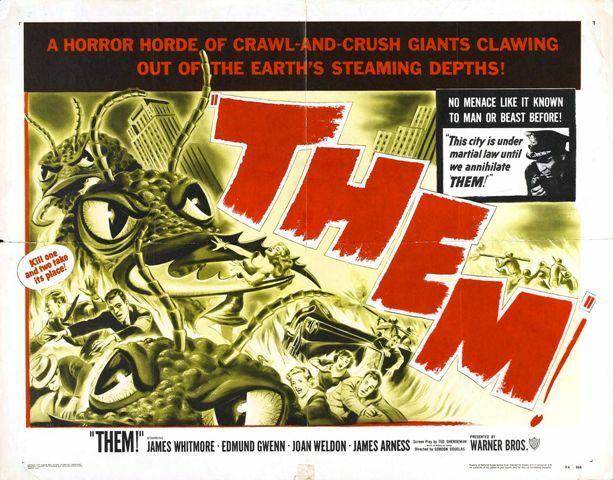 The 1950’s featured two main types of science fictions films: monsters resulting from nuclear radiation (such as THEM! and GODZILLA, KING OF THE MONSTERS) and alien invasion films. Both subjects were based in reality so to speak thanks to the bombs dropped on Hiroshima and Nagasaki in August of 1945 (ands also nuclear testing here in the states) as well as the increasing number of UFO sightings world-wide. When you look through the list of titles of movies released during this time, it amazes me at how many of them were genuinely good. With their limited budgets they had to rely on something rarely seen these days in genre films…good storytelling. Because the stories were usually well told, even the hokiest of effects were accepted. Today it’s all about the effects (just look at any film by filmmakers Roland Emmerich and Dean Devlin or George Lucas with the STAR WARS prequels) with good storytelling taking a back seat, or not even appearing in the vehicle. What I present for you here in this series is alien invasion films of the 50’s. These will include films where the aliens come here as well as films where we go to them. For each film I cover I will include the basic plot as well as my personal review of why it should, or shouldn’t, be seen. This series in no way covers all of the films of the 50’s, just the ones that I feel are important. So here we go…starting with 1950! 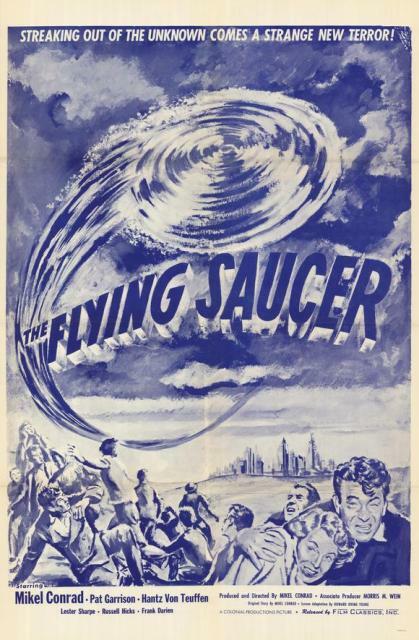 The first movie I will discuss is THE FLYING SAUCER, directed by Mikel Conrad. I believe this is the first movie dealing with flying saucer sightings. It is more of a spy thriller than anything else and tends to be slow-paced, thanks to much of the movie concentrating on the beautiful scenery of Alaska. The film starts out by thanking the cooperation of those people in authority, but never mentions who these people are. The US government wants to capture the flying saucer being seen and use it to transport atomic weapons (and of course the Russians are looking for it as well). Upon hearing that the Russians are looking in Alaska, Mike Trent (played by Mikel Conrad) is sent to investigate with secret service agent Vee Langley (played by Pat Garrison). The couple falls for each other over the course of the film, which is standard for most of these movies. Hans (played by Hantz von Teuffen), the caretaker of the cabin where Mike and Vee are staying, acts suspiciously throughout. Is he a Russian spy or something else? Mike is skeptical of the UFO’s validity until he sees it for himself. It turns out the flying saucer is not from outer space but from right here on Earth, the creation of an American scientist, Dr. Lawton (played by Roy Engel). Lawton’s assistant, a communist sympathizer, is trying to sell the saucer to the Russians. 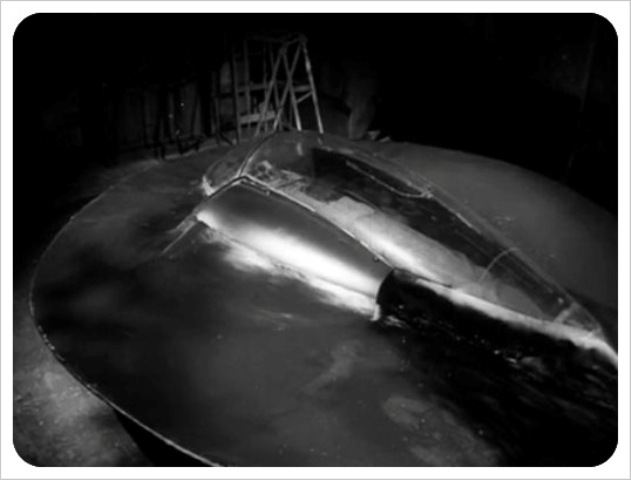 Eventually the bad guys are caught and the saucer is destroyed, never to be used as a weapon. Thankfully most of the movies that followed this snooze fest are a lot better. The pacing is horrible, non of the characters are even the least bit likeable, and there just are not enough scenes of the flying saucer (plus the music constantly playing in the background will easily put you to sleep as well, though it sounds amazingly like the theme to STAR TREK). If you are a completist with these films, then check it out. Otherwise avoid it at all costs! The reason it is even mentioned is because it is the first of its kind! 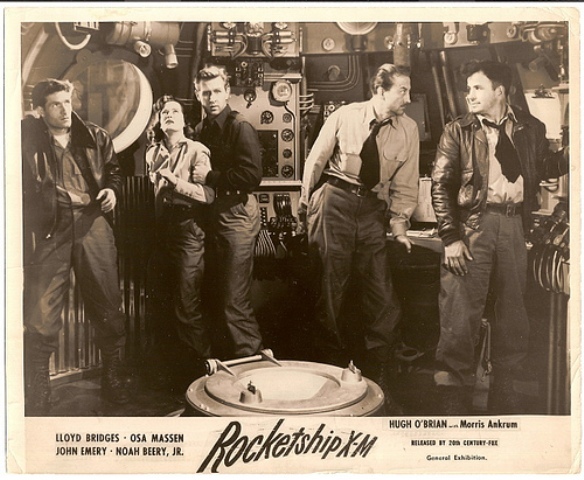 ROCKETSHIP X-M is a fun little film starring the late Lloyd Bridges. 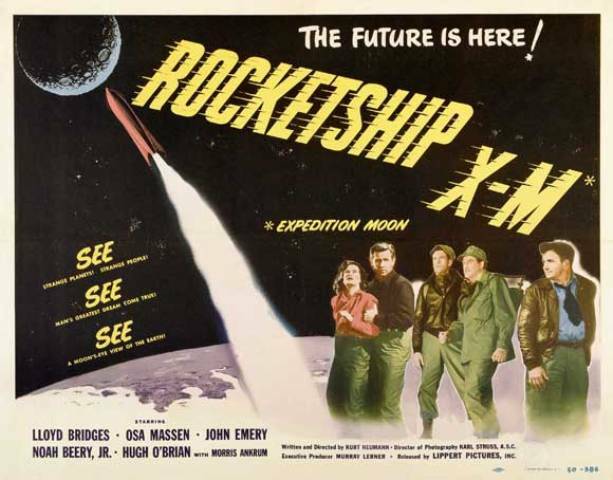 A crew of five (four men and one woman) are on the first mission to explore the moon, using Rocketship X-M (or Rocketship Exploration Moon). As they are on their way they have a fuel issue and the ship shuts down. After correcting the problem the ship blasts off into a new direction directly towards Mars! Upon landing, they find evidence of an advanced civilization and encounter some of the violent residents of Mars, who look a lot like cavemen. Apparently the advanced civilization destroyed themselves with nuclear war causing the survivors to turn into savages. Two of the crew are killed before they are able to re-board the ship and escape, heading back to earth. Unfortunately, the Rocketship X-M runs out of fuel in earth’s orbit and the rocket crashes on the earth’s surface. Though the mission is deemed a failure, it is quickly announced that a Rocketship X-M2 will be made to further space exploration. The setting of Mars was filmed at different desert locations and the scenes were tinted red to give it a Mars’ feel (much like in THE ANGRY RED PLANET from 1960). The first half of the film, leading up to the landing on Mars, is kind of slow paced but it does get better once they do land. The “martian” landscape is bleak and is a perfect setting for the tone of the film. You really get a feel that there was once something here, later destroyed by the inhabitants. I also found the scene of Lloyd Bridges and Osa Massen looking out the window of Rocketship X-M as it quickly crashes to the Earth to be somewhat realistic and terrifying. This movie truly set the bar for what was to come throughout the rest of the decade as many scenes from this film were copied for later entries. I do recommend this film. This entry was posted in Alien Invasion Films! and tagged Angry Red Planet, discs, flying saucers, Godzilla, Kenneth Arnold, King Of The Monsters, Rocketship X-M, The Flying Saucer, THEM!, UFOs, World War 2. Bookmark the permalink. ← Old School Monster FX Highlight Sid Haig’s CREATURE!